by Beth Simmons. New York, Cambridge University Press, 2009. 468 pp. Hardback $96 ISBN 9780521885102. Paperback $31.00 ISBN 9780521712323. Upendra Baxi, Emeritus Professor of Law, University of Warwick and Delhi; Fellow, Kate Hamburger Kolleg, Institute of Law as Culture, Bonn. The question of relationship between ‘norms’ and ‘behaviour’ has been central to sociology of law and legal theory, even when the frameworks for understanding this relationship have varied, the operationalization of the notion of norms has differed, and empirical methods used have been constantly subjected to contestation and renovation. Understandably, conventionally erudite international law theory and some emerging discourses on sociology of international law do not foreground such concerns, preoccupied as these remain with consensual norm-setting processes and enunciations of state responsibility. Mediating state sovereignties towards securing normative agreements about the conduct of each individual state towards other states and peoples, of the ‘community’ of states towards restraining acts of war, war-like acts, and even occasions of ‘humanitarian intervention’ constitutes in itself a Sisyphus-like labour. Even so, and increasingly now, specialists in international relations and organizations remain concerned with the nature, number, scope, justifications for (and modes of effective compliance with) human rights norms and standards. This magisterial work exemplifies an array of concerns/questions: Why do states subscribe in the first place to treaties generally, and especially international human rights treaties (HRT, hereafter)? In what ways does the very act of signing a HRT create a gravitational field within domestic politics? How may we understand and explain strong forms of exceptionalism (non-ratification of HRT) compared with weak forms (ratification with reservations or derogations)? In relation to the latter, in what ways and with what impact the apex Courts, mostly in the Global South, proceed to ‘endogenize’ (a favourite term of Simmons) or socialize HRT obligations? In what specific ways do the patterns of adjudicatory leadership thrive in active partnership with human rights and social movement actors/networks and with learned professions? How may, in this regard, the specificities of constitutional texts, and particularities of hermeneutic traditions, serve simultaneously as a resource as well as a constraint for sustained solicitude towards HRT obligations? In posing suchlike concerns, Simmons inaugurates many fresh starts in what I have named the comparative social theory of human rights. This high achievement is further enhanced by a nuanced understanding/exposé of methods–type concerns. Although Simmons does not so name her field, her exploration comes close to the traditions of impact studies so familiar to law and society and critical legal studies scholarship. A salient question for impact studies is how firmly one may distinguish ‘symbolic’ from ’instrumental’ political (including adjudicatory) action (see Baxi, 1982). If the former stands designed to unfold some long-term aspects of cultural change (some new histories of mentalities – attitudes/ dispositions/ doxa) -- the latter seeks to accomplish [*38] human rights results/outcomes in ‘now-time’. As with impact studies, further extended to HRT, Beth Simmons faces the problem of method: when a multitude of variables possesses explanatory powers, how may HRT be privileged in terms of any causal explanation? Simmons recognizes that many factors may explain HRT- oriented state conduct. Put summarily this means that the itineraries of HRT vary according to: (a) political regimes types (degrees of democratization); (b) differentiation of governance structures (especially the detail and design of federal structuring but more crucially the open spaces marking the relative autonomy of legal and adjudicative professions); (c) societal/cultural differentiation (the rates of secularity/secularization); (d) the varying presence of solidarity of social and human rights movements (further empowered by development of information and communication technologies); (e) the overreaching contexts of global politics (Cold War, earlier and the wars on ‘terror’ now); and (f) the ways of legalization/ juridicalization of human rights. The difficult concept (if only because it is so nebulously well-worn) of mobilization acquires a new lease of life in this work. It is neither a monolithic or static concept and perhaps it would not be far wrong even to suggest (although Marx does not even find a single mention in the book) mobilization is deployed as a dialectical category. If mobilizing for human rights leads at one point of time to the forms of governance appropriation of HRT witnessed, for example, in the riot of reservations in their ratification, it also at other moments provides ‘political opportunity... to mobilize’ variously HRT demands by the affected groups (p.201). This work then explores the complex cartographies of movement-based translations of some core HRT obligations in ‘domestic politics.’ Simmons richly demonstrates that ‘mobilization’ varies from one HRT regime to another; some specific HRT obligations involve mobilization for and against (for example death penalty and reproductive rights); ‘political opportunities’ for mobilization also vary not just according to HRT regime type but also according to the ways in which social movements and human rights activists proceed to incorporate the HRT-type demands of adversely affected groups into their own viable programs of action. Further, the capacity of apex adjudicators to translate treaty commitments into constitutional jurisprudence and their willingness to ensure executive and administrative compliance also remains variable. These then represent some of the specifically internal HRT variables to which this study is devoted. Isolation of distinctive type HRT impact thus entails a rigorous recourse to both external and internal ‘control’ variables (pp.270-73). Via her favourite images throughout this work about the ‘positive effects’ of HRT and ‘mobilization for human rights,’ Simmons navigates us to an understanding of HRT as constitutive [*39] elements, within a welter of many variables, as conditioning, but not determining, state conduct. Put another way, Simmons tends, wisely and well, towards a rigorously pursued co-relationist rather than a causal methodological approach. Her concern is with the emplacement of HRT as a crucial explanatory framework, impacting on state conduct and behaviour of central political institutions, and processes. A central insight of this book is just this: if HRT production may constitute global politics by another name, HRT also impact on the ways of doing politics: if HRT ‘reflect’ politics, they also eventually ‘alter’ politics (p.12). HRT are thus critical events; if so, a compelling task is to fashion our empirically-based models of ‘event histories’. Thick descriptivism then may not shun quantitative methods exploring such histories. HRT are political events not so much because they mark an advent of any post-ideological discourse, but rather because these invite scrupulous attention to behaviour/conduct of state and inter-state acts of entrepreneurship. To this end, Simmons offers ‘a theory of rationality of expressive ratification’ (pp.64-68) which explains both the sets of decisions to ‘commit’ and to ‘comply’ with HRT regimes Both sets are ‘expressive’ in the sense of articulation of sincerely held human rights values and a belief that a growth of common moral sentiment around the idea of human rights is a good portent. Perhaps Simmons may fault this act of reading; even so, the theory she proposes carries messages about an ethic of human rights. More circumspectly read, the ‘theory’ is all about aggregating state-specific preferences, which direct attention to the ways in which governmental and intergovernmental actors and networks estimate latent and manifest (‘sunk”) costs of acts of the mere signing of an HRT of course HRT ratification costs, non-participation in these being no longer available as an instrument of diplomacy. Important remain here two sorts of concerns: How may one fully understand and explain the phenomenon of otherwise ‘rights-respecting’ state failure to commit (ratify) HRT, and the ways in which some ‘rights-abusing states’ do indeed ratify HRT? The raising of these questions marks in itself an advance in the state-of-art, no matter what one may think about some ‘false positives’ and ‘false negatives’ frameworks put here to some heavy-duty labours of explanation (pp.67-80). HRT, in any event, further need to be explored in terms of sophisticated state practice of the accumulation of risks’ whether in terms of the Cox and Probit models. If the former speaks to us a Cox proportional ‘hazards’ model estimating in some ways the ‘hazard rate’ of HRT obligations, the latter specifically refers us to a ‘ simple’ Probit model that ‘estimates the likelihood that a particular factor is associated with reservation-making’(pp.80-81). Doctrinal international lawpersons may ignore this message at their own peril of obsolescence, if only because their doxa (the ‘heaven of juristic conception' as [*40] Rudolf Von Jhering named this a long while ago) is no longer neither necessary nor sufficient for grasping HRT productions and their aftermaths! Further, contrary to the post-ideological throughways of thinkers that I fondly name as A-to-Z (from Agamben to Žižek) club/hub, Simmons reminds us all that any serious-minded understanding of the ‘hows’ and’ whys’ of HRT needs to be grasped (in my terms) as serial, yet also cumulative, contingent necessities of doing global, supranational, regional, and domestic politics. Metaphysical/postmetaphysical critiques of the idea of human rights may not any longer ignore the salient concerns and findings of this work. Simmons deftly pursues as well some ways in which HRT may fully function as a relatively independent variable. She resolutely pursues this task conceptually as well as empirically. Chapters 3 and 4 address the crucial issues of theories of and about ‘commitment’ and ‘compliance’; Part II of the work addresses some specific HRT regimes concerning civil and political rights, death penalty, torture, women’s rights and child rights. In each study, Simmons offers, with formidable fecundity, an account of HRT- induced transformations. This is, indeed, an impressive, enviable and enduring achievement - a high praise yet fully merited. ‘Politics’ of HRT emerges here (in my diction at least) both as politics of and for human rights (Baxi, 2008). As concerns the former, Simmons all too frequently, and rightly, reminds us that as treaty- makers governmental actors remain key players in their production, even when this does not ignore the diffuse and diverse increasing influence of human rights and new social movement actors amidst these processes of production. Yet, state ratification practices place some necessary, even some terminal, limits on the much-celebrated, and unguarded, forms of romanticization of their role. Simmons, however, brings to a full view their pivotal role in ‘domestic politics’ as agents/actants for ‘mobilizing for human rights.’ In this way, she acknowledges their presence and contribution but not their creationist contributions to which I refer summarily in the concluding section of this Review. ‘Mobilization for human rights’ in this way remains in the first place a function of differential contextualized appropriations HRT. These refer us both to patterns of ‘global’ politics (the many phases of the ‘Cold War,’ and their active residues and now ‘neoliberal’ state formations and governmental/intergovernmental auspices—offering some variegated human rights portals and also portfolios) as well of ‘domestic politics.' Second, Simmons offers an impressive demonstration of the logics of post-ratification costs (see, especially Chapter 4). Third, how far HRT studies grasp these performatives of adjudicatory action as ‘trade off[s] between’ 'decision costs’ and ‘external costs'? If ‘decision costs are the time and effort needed to make a decision,’ external costs are the losses 'an individual expects to endure as the result [*41] of the coercive actions of others’ (see Dougherty and Edward, 2001). At any rate, fourth, ‘mobilization’ in itself - a commonsense category of social action everywhere - entails now a carefully nuanced grasp of an empirically based new commonsense; Antonio Gramsci would have today endorsed reading Beth Simmons precisely this way! Simmons thus brings within these contexts some extraordinary assemblages of human rights stories and histories. The immense value of this work lies precisely in detailed qualitative as well as quantitative narratives in Part II. Thus, to take but one example, Chapter 5 enables us to grasp why the International Covenant on Civil and Political Rights (ICPR) produces different ratification effects/costs as well as opportunities, compared and contrasted with a more specific regime of the Optional Protocol on Death Penalty (OPDP). In this register, crucial remains her finding that ‘death penalty is much more likely to exist and much less likely to be removed in countries that have had recent civil war experience, although not necessarily embroiled in civil conflict at the moment’ (p.198). However, also remains important the fact that the ‘substantive effect of OPDP on repeal of death penalty was four to seven times larger’ than some due process (fair trial) entailments of ICPPR’ (p.198). To reiterate, equally crucial remains the finding that ‘not all kinds of issues’ elicit ‘identical’ ‘degrees of domestic mobilization’ (p.199). I resist the temptation to revisit other chapters, notably Chapter 6 (CEDAW) and Chapter 8 (the rights of the child) that richly repay several readings. For me at least it is Chapter 7 dealing with the UN Convention against Torture [CAT] that constitutes a ‘bleeding heart’ of this book, given some evidence that the ‘spreading of an international norm against torture has...not limited the practice of torture to any extent,’ and ‘reported practice [has] worsened as the Convention Against Torture gathered more adherents’ (Gilligan and Nesbitt, 2009, pp.456-66). Simmons also finds that not merely the sites of torture are diffused across governmental actors; some studies show an alarming ‘null effect’ for CAT (p.264). Indeed, ‘some governments indulge in ratification [that] will earn them some cheap credit with the international community’ (p. 265). This is the worst unkind cut indeed manifest in some recent Indian policy posturing; at least the initial Bill passed by the Lok Sabha ( the House of People) seeking to implement CAT in effect provided a for more complete regime of immunity and impunity for public officials. In the meanwhile, the Supreme Court of India, like the apex courts of Chile, and Colombia and other deeply troubled societies, have already begun the tasks of translating into action the CAT /HRT obligations. Compared with some pre-norm/ post-norm, or ‘before/after‘ HRT impact studies, Simmons takes seriously the interface between national constitutional human rights norms and standards and core HRT regime obligations as mediated by activist justices in partnership with learned professions (such as legal, medical, and media [*42] professions) and ‘civil society stakeholders.’ Granting this fully does not eclipse the importance of further taking seriously a caution against ‘conflating behavioural norms and deontological norms,’ well sounded by Gilligan and Nesbitt. How this caution may affect our acts of reading Simmons must remain an open question, indeed. The space of this Review does not allow any elaborate reflection concerning the issues thus raised. Even so, a few and rather dense remarks are needed. First, this work speaks to us about the HRT- oriented conduct of relatively large states. Small, and many impoverished Global South, states incur huge participation costs in the somewhat endless HRT negotiations; HRT ratifications costs are also relatively high than in typical large polities. This existentially real aspect does not, overall, command much attention in this otherwise fine work. Second, the question concerning ‘exceptionalism’ in relation to HRT engages Simmons in manifold contexts. There are at least two kinds of ‘exceptionalism.’ Simmons for sure is a sage guide for our understanding of some theology-based reservations/derogations from the CEDAW. The concern here emerges in this register in terms of theologically ordained truths that carve out exceptions to women’s’ rights as human rights (and even some aspects of Child Rights Conventions). As far as at least I read her analyses, the question is not one of confrontation between ‘universality ‘of HRT and cultural specificity (as privileged by the custodians of traditions) but rather one that concerns intersections between politics of and for human rights. The standard case of other kind of exceptionalism is posed by American resistance to most HRT, justified almost always by its recourse to its rather robust federal constitutional structuring and a strong adjudicative tradition regarding the Bill of Rights. Some recent US subscription to HRT does not weaken the US ideology of strong exceptionalism, whose impact within -US and globally still awaits a fuller narrative. There is also a problem of judgement: if US exceptionalism may claim the dignity of being benign, on what grounds other states may be less eligible for a similar claim to respect, especially as regards heir distinctive constructions of soft exceptionalism? Third, almost singularly absent is the concern with leading non-state, yet state-like and even state-transcendent actors. The figuration of armed opposition groups is not entirely absent; yet worrisome remains the inadvertence to the role that the agents and managers of global capital – mostly the MNCs but also the complex of international and regional financial institutions and communities of direct foreign investors – raises at least two sorts of concerns: (a) How far these multiplex entities/agencies/ networks erect a new ‘Berlin’, or resurrect the ancient Chinese, wall between the regimes of human rights law and jurisprudence and those of international economic law, and (b) how these entities/beings may still [*43] ‘legitimately continue to erect some ‘firewalls’ of immunity and impunity against HRT- based claims urging their minimal human rights responsibilities towards communities of danger, hurt, and harm remain still possible and sensible (see, Baxi, 2008: Chapters 8 and 9). Finally, and for the moment, a question arises concerning the ways in which Simmons outlines the history of human rights (Chapter 2). Dating this with the adoption of the Universal Declaration of Human Rights (UDHR) reflects a widely shared, yet deeply flawed, view of the ‘Western’ origins of human rights. Simmons has considerable purchase on early avatars of an incipient global civil society as well as of some UDHR as well as the Cold War figurations (pp.36-41); she even recognises alternate histories of human rights suggesting at least that the authorship of contemporary human rights indwells ‘the pockets of resistance’ (insisting on ‘growing state accountability that has proved fecund for the development and observation of rights under discussion) and thus signify the gains invariably almost ... hard fought' (p.12). Simmons further reflects on the possibility that but for the efforts of decolonized nations and peoples the UDHR may not have fructified into an International Bill of Rights but only meagrely as ‘advocacy revolution’ (p.56), eventually frustrating Dwight Eisenhower’s quaint remark that the UN Convention of Social, Economic, and Cultural Rights ushers in ‘socialism by treaty’ (p.45, emphasis added). Even so, and overall, for Simmons the problematic of HRT remains framed in the diction of ‘mere externally validated [human rights] scripts’ providing access to ‘alluring... world cultures.’ In this way, however, Simmons affirms and even celebrates an approach that ‘emphasizes the hegemonizing influence, over time, of displays informed by dominant Western values’ (p.64). It would indeed be an extravagance on my part to reiterate my alternate readings of ‘origins’ of human rights in the histories of the non-European others who invented human rights which a post-Westphalian world ordering now discovers (see, Baxi, 2008), or to bring to Simmons’ attention the rich and exciting work of TWAIL (third world and international law) scholarship. 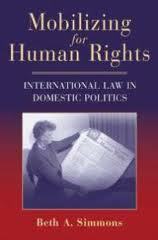 Perhaps, the photo-cover of this book presenting a redoubtable imagery of Eleanor Roosevelt reading UDHR scroll may have been enriched by montage of figurations of equally significant other ‘M’s - Mahatma Gandhi, Mandela, and Martin Luther King Jr. This fully said, this monumental work fully deserves TWAIL critical attention, and of course much beyond. Baxi, Upendra (1982). "Who Bothers about the Supreme Court? The Problem of Impact of Judicial Decisions," The Journal of the Indian Law Institute 24:4, 848-62. Baxi, Upendra (2008). The Future of Human Rights. 3d ed. (Delhi: Oxford University Press). Dougherty Keith L. and Julian Edward. (2011). The Calculus of Consent and Constitutional Design. New York: Springer. Gilligan, Michael J. and Nathaniel H. Nesbitt. (2009). "Do Norms Reduce Torture?" The Journal of Legal Studies 18:2, 445-68. Copyright by the Author, Upendra Baxi.